Imphal, May 04 2014: Chief Minister O Ibobi Singh joined by his Ministerial colleagues and Shree Shree Govindajee Temple Board members reviewed the development works of the Temple and its hall. Along with emphasising on accelerating the ongoing works to complete the same ahead of an upcoming religious event the special meeting held today also decided to decorate the temple's twin domes with gold plating. Besides, the Chief Minister, who is also the Board's president, Works Minister Dr Kh Ratankumar Singh, PHED Minister I Hemochandra Singh, former MLA Kh Loken, SDO (Imphal East) Salam Somorjit and Board members were present at the meeting. Noting that repairing/reconstruction of Govindajee Temple and its hall had respectively commenced on October 17 and 18 last year, the CM advised the Board members to issue necessary instructions to the construction agency for completing the project ahead of the Maha raas festival scheduled in November this year. According to the Temple Board's Panji Shanglakpa B Rajendra Sharma repairing of the Govindajee include raising its base to avert submergence of the religious structure during rainy seasons. Confiding that cost as well as quantity for gold plating of the domes is being estimated, he said tiles would replace floor of the temple. The gold plating was removed in 1998 for necessary repairing work. Further maintaining that the repairing/construction works are being carried out by the Board and Tourism Department with Rs 8 crore assistance by the NEC, Rajendra said donation from the public might be necessary in case the NEC fund falls short. 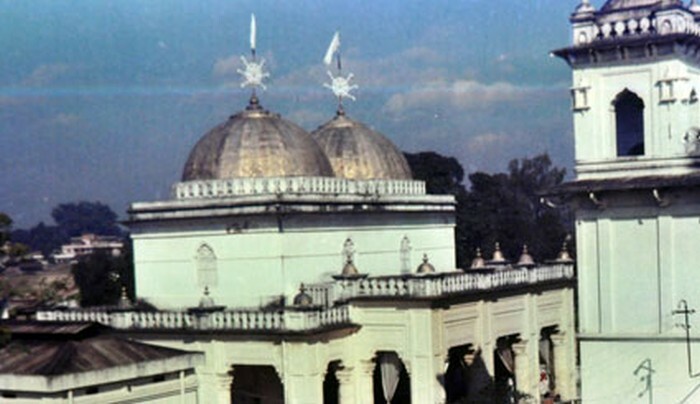 The temple is said to have been built at its present location in 1907 by Maharaj churachand and the hall three years later.